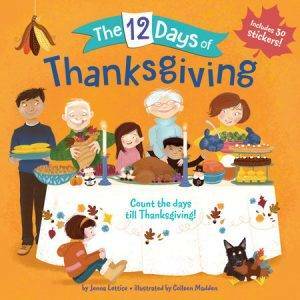 Reading this sweet story could be a new Thanksgiving tradition in your classroom! How can you win the book? Submit a comment to this blog to share one thing you love about Thanksgiving. Send your comment by Sunday, November 18, and we’ll rush the book out to you. One lucky teacher will be randomly selected to win. November 13 is World Kindness Day. Download a free kit to get kids started spreading kindness on that day and every day. The kit includes activities, a poster, photo props, and compliment cards to get things rolling. Click here. The kit is inspired by the bestselling book Wonder. 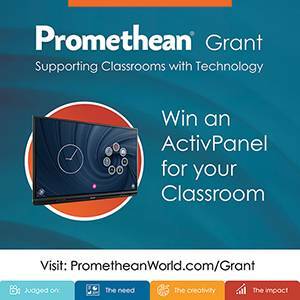 Good news, the deadline has been extended to enter for a chance to win a Promethean ActivPanel. To enter, create a short video to show how your class would benefit. Twenty classes will win. The deadline is now December 1. Get started at prometheanworld.com/grant/. Do you know a group of budding botanists? Apply for a 2019 Budding Botanist Grant at kidsgardening.org/2019-budding-botanist-grant. Grant recipients can use the funds for a new or expanded school garden program that teaches environmental sustainability and the importance of biodiversity. Hurry, applications are due November 19. There are many things I love about Thanksgiving, but my mom’s apple pie tops the list. Fresh out of the oven and made with love! PS: Looking for some meaningful resources for Veterans Day? Visit va.gov/opa/vetsday. I love getting together with my family and friends during the holiday! The one thing I Love about Thanksgiving is simply just having the break from work. I love my work family and kids, but just being able to have time off is the best to regroup and refresh getting ready for the busy holiday season ahead! Having family together is THE BEST! I love cooking for and spending the day with family. Being with those I love and NOT being in a hurry for a change. I love being with family at Thanksgiving. The food and getting the extended family together. Spending time with family and getting a wonderful meal! Good food & great family! Being with family and friends, especially this year because I will be spending it with my very first grandchild who was born on Christmas Eve 2018. With my family and friends. I love Thanksgiving because I get a 4 day weekend!! Thanksgiving is the one holiday that I see my cousins and their extended families. We all share our favorite recipes and enjoy catching up. We laugh, take photos and share stories and EAT!!! Love getting together with my family and friends and sharing a delicious meal. Watching the Macy’s Thanksgiving Day parade and taking a fall walk after dinner are also family favorites. Loving to cook with my children. One thing I love about Thanksgiving is getting together with my extended family. ( My cousins, aunts, uncles, etc.) It is good to know that there are people who will love you no matter what. I always feel calm and “at home” when I am surrounded by my family. I love how my family and friends all get together and have a Thanksgiving feast, watch the parade, football, play a few games of cards, and just enjoy each others company. I love spending Thanksgiving with family and counting our blessings. Thanksgiving Day Parade BINGO with the family! My husband and I spend the day reading and preparing food and then we have a very quiet dinned using my grandmother’s china. Alone time can be the best time. I love time with family and friends during Thanksgiving! Thankful for being with those I love ???? My favorite part of Thanksgiving is the focus on gratitude and family being together. I love that the Pilgrims and Indians came together in peace at the first Thanksgiving. I love that we dont have to be thankful for all that we have only one day in the year. I also love the reminder of how our great nation came to be founded! In our family we don’t just celebrate Thanskgiving we celebrate many many birthdays in November. It starts,on November 11 with my Gram and continues till the end of the month. My birthday is November 15th! I love having my children who live far away come home to spend time together! I love Thanksgiving because I get to spend time with my family and it helps me remember things I should be thankful for. My favorite memory of Thanksgiving is eating at a large table with my grandparents. My grandma would always make delicious dressing balls from her leftover buttermilk biscuits. I have since tried to duplicate her recipe, but it’s not the same without her delicious biscuits. I am thankful that my children can experience the family tradition although my grandparents have passed away long ago. Faith, Family, and Friends. Relaxing and enjoying all three! I love having my whole family here for dinner. I love the cooking and baking too! Family, food, and making memories as we gather and give thanks for all we have. I love the delicious food and reminding ourselves what we are grateful for. I love the stuffing and seeing family that I have not seen since the last Thanksgiving! I love the concentrated attention on gratefulness just before the gimme season…hopefully the one balances the other somewhat. Thanksgiving break means that I can pull out my favorite lessons – Holidays Around the World! Geography and ELA all rolled together in a super engaging way for the students! There is nothing better than being with loved ones.